Dilwale is Shahrukh Khan ‘s 6th consecutive 100 crore grosser. 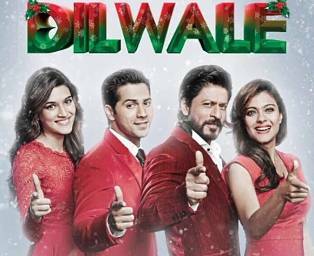 On its second Friday Dilwale has lost most of its screens and shows at multiplexes. Producers have already made their money but distributors might lose some money with Dilwale. 24 Crore nett Producer Figure .India. 23.03 crore nett Trade Figure .India. 20.04 crore nett Trade Figure .India. 20.98 Crores nett Trade Figure .India. 1.) Dilwale has collected 21-22 Crores as per Trade Figure estimates which is the 3rd highest of 2015 behind Prem Ratan Dhan Payo and Bajrangi Bhaijaan. This is a highly discputed number as both Dilwale and Bajirao mastani are claiming a 3000 screen count in India which cannot be possible as total India screen counts are lower. Red Chillies Entertainment is itself distributing Dilwale and has sold the all India theatrical rights of Dilwale for Rs 130 Crores to individual distributors by territory. Overseas Rights have been sold at 40 Crores Minimum Gurantee and an overflow if overseas crosses a certain number. Sattelite Rights have a box office performance clause and should fetch 45 crores if the movie crosses 200 crores at box office.